A feature of the earliest urban development plans in Washington, DC, H- and I-shaped alleyways are scattered throughout the oldest neighborhoods in the city. These narrow arteries connect public-facing streets to enclosed passages—and are perfect for an easy escape from or shortcut between DC’s car-dominated streets. In a pattern that harkens back to the way the large urban plots originally evolved, stately rowhomes conceal alleys sprinkled with buildings and busy storefronts. Insulated from the bustle of downtown, the historic alleys of DC’s oldest neighborhoods such as Shaw, Mount Vernon, Georgetown, Capitol Hill and Foggy Bottom may have been forgotten or disdained in the past, but they are having a resurgence. Whether because of their charm and seclusion, their compact scale, or simply because they are a testament to a city before cars, Washington’s old alleys offer an excellent lesson in building spaces for people. By reclaiming alleys as the heart of blocks rather than neglected back roads, cities can foster community and inclusivity through new shared spaces and facilitate the development of housing and commercial properties on a human scale. On cool, sunny days, locals take to the streets for a stroll, often rambling by chance through one of DC’s remaining historical alleys. There, one can discover family homes, hidden shops and restaurants, or coves of small offices and garages wrapped in ivy. But these alley streets have not always been so quaint and quiet. After the Civil War, freed slaves moved to Washington, DC in waves and encountered a paucity of suitable housing. This rising population and lack of transportation options led to a demand for housing that inspired white property owners, recognizing an opportunity for profit, to construct primitive structures along the city’s alleys, which they could rent to the influx of individuals and families seeking homes. Throughout the end of the 19th century, these houses, which typically lacked basic modern provisions such as heat, electricity, water, and sewage connectivity, would become a point of political focus as generations of social reformers called attention to the ramshackle structures and the ‘immoral’ actions of their inhabitants. Despite being perceived as filthy and chaotic, the communities that developed among neighbors in these alleys were often complex, interconnected, and resilient urban spaces. As DC’s large city blocks and small alleys became home to increasingly more people, the pattern of development that unfolded throughout DC was typical of the time: people lived near their workplaces, and blocks were interspersed with buildings of many uses that adequately met the wide-ranging needs of a diverse group of individuals. However, ‘walking cities’ started to disappear with the advent of the streetcar and, later, the automobile. Like many pedestrian-oriented areas throughout the United States, alley dwellings in Washington, DC began to see their demise in the 20th century. This dissolution was largely rooted in the birth of new forms of transportation which reduced the need for dense city blocks, enabled wealthier Washingtonians to push towards the growing suburbs, and catalyzed the replacement of many alley dwellings with stables and garages. The Alley Dwelling Authority (ADA), created by Congress in 1934, accelerated the downfall of these intimate alley neighborhoods. Established with the intention of ridding the city of the predominantly black alley communities, which were often seen as dangerous slums by those on the outside, the ADA facilitated the demolition or sale for private redevelopment of thousands of alley residences throughout the city, forcing many working-class families from their homes. Today, over 1,200 of these historical alleyway structures, including alley dwellings, stables, warehouses, and garages remain in the District. 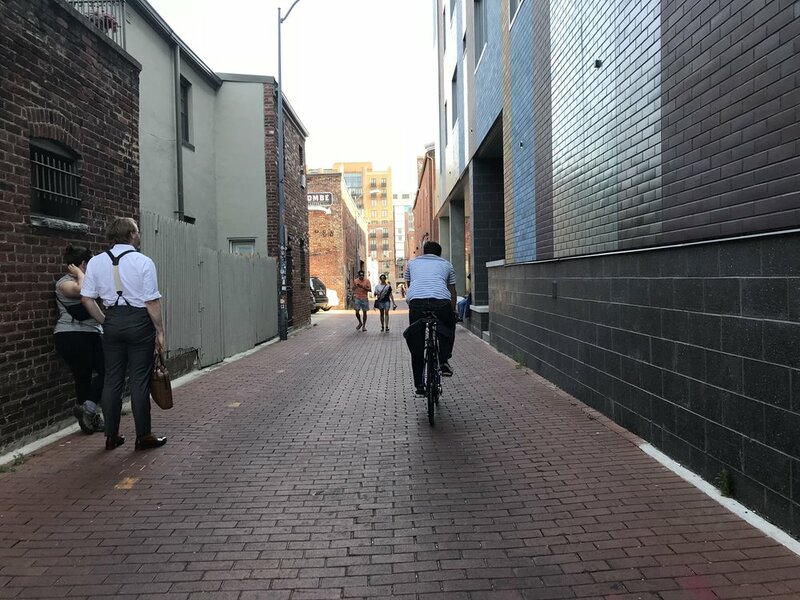 Perhaps in a nod to the cultural fabric of DC’s alleyways or in keen recognition of the potential of this dense land use, many developers have begun to imitate or embrace the city’s extant alley structures, and in doing so have successfully forged some of Washington’s most popular cultural destinations. Nevertheless, visiting some of even the most renown alley destinations (such as The Dabney in Blagden Alley, which holds a spot on the city’s growing list of Michelin starred restaurants) feels like uncovering a secret past. Tucked inside of a large city block, Blagden Alley conceals garages-turned-offices and homes, the DC Alley Museum, and some of Washington's best known restaurants. Once derided as a "blind alley" that bred crime and disease, the alley now draws people from all over the city to linger, snap photos, and chat. In a rapidly growing city with 700,000 residents and soaring property values, an unmet need for housing—particularly affordable housing—in DC’s urban core has come to the fore once again. Today’s need for increased density and additional affordable housing has not been lost on current Washingtonians, many of whom have been forced to seek cheaper housing in DC’s sprawl, nor policymakers, who have proposed numerous creative solutions to the housing crunch (including one bill that took aim at vacation rentals) with meager success. Development of alley-facing lots for residential or commercial uses may offer a nostalgic solution to the city’s demand for land and rising inequity, and one that is widely appealing and people-friendly. Palmer Alley is the main thoroughfare of City Center DC, a mixed-use, pedestrian-friendly development that opened in downtown Washington in 2015. The alley, which is lined with high-end shops and restaurants, demonstrates the appeal and popularity of alley-centered development. However, density-increasing development faces many challenges in DC and in cities throughout the U.S. In wealthier DC neighborhoods where attached, single family homes dominate the architectural fabric, residents object to development for fear of obscuring the character of their historic neighborhoods. Though the alley revitalization solution may temper this fear, zoning codes have been slow to keep pace with the needs of the growing cities of today; until 2016, development of structures on alley lots in DC was highly restricted due to the legacy of conventional, separate-use zoning in DC, and property owners still must navigate the municipal bureaucracy to bring an alley-facing development to fruition. Many cities around the country are beginning to see the benefits of learning from development patterns of the past. The continued reactivation, preservation, and restoration of alleys represent not only an opportunity for the District to turn back towards its “walking city” roots, but a lesson for all burgeoning cities: by reclaiming alleys as the heart of our blocks rather than as neglected backroads, cities can foster community and inclusivity through new shared spaces, and facilitate the development of housing and commercial properties on a human scale.